Brett Johns is aiming at a fight in London after entering the top 15 in UFC's bantamweight division. The 25-year-old is ranked 13th in the world after beating American Joe Soto in Las Vegas on 2 December. Johns' aim is to be the first Welshman to win a UFC belt, but for now has his sights on a return in the New Year. "I don't want this rollercoaster to stop so I'm looking to get back in there March time in London," Johns told BBC Wales Sport. 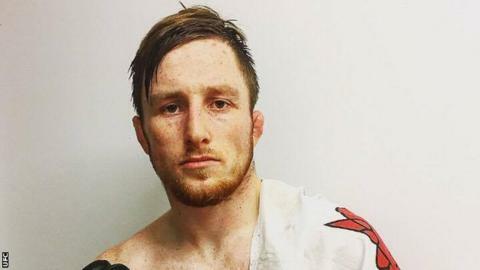 "I'm happy to be representing my country and being the leading man of Wales in mixed martial arts. "I do genuinely believe that I can win that belt and be one of the greatest of all time, you've just got to take your time and plenty of training." Johns, from Pontarddulais in south Wales, says he does not mind who he meets the next time he enters the cage but expects it to be a formidable challenge. "I had a chat with my trainer and we looked at the fighters I'm alongside and they all scare the life out of me," he conceded. "In my mind it doesn't matter. Give me the best guy they've got ... it doesn't matter to me. These are the greatest fighters on the planet and I think I'm up there with them. "So why should I be picking and choosing - give me the best guy you've got and we'll take it from there. "My job is to win that gold belt and I'll be the first representative of Welsh mixed martial arts to do that, I promise you."